You are currently browsing the Archaeofacts.com archives of Musings for the day Wednesday, January 7th, 2009. Don’t get too focused on this, but notice how many times these two words are misused in the coming days: lectern and podium. Remember: podium has a root in pod-, meaning foot (podiatrist! ); thus, you stand on a podium. That thing that you stand behind that holds your notes: that’s a lectern (its root is in a word meaning to read). 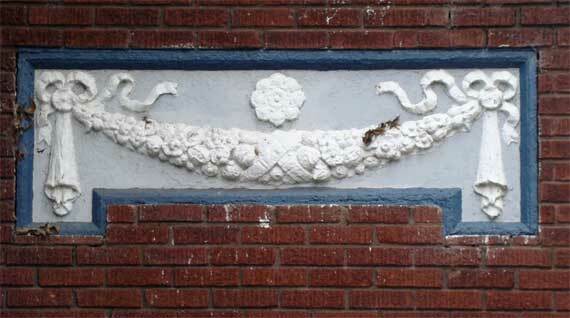 As to the picture: this detail is above the door to the stairs to the second-floor units in a four-apartment building. I think the structure was built as apartments, and is not a converted single-family home. Still, this is a lovely detail that cost extra initially, and extra money continues to be spent to keep it bi-color.